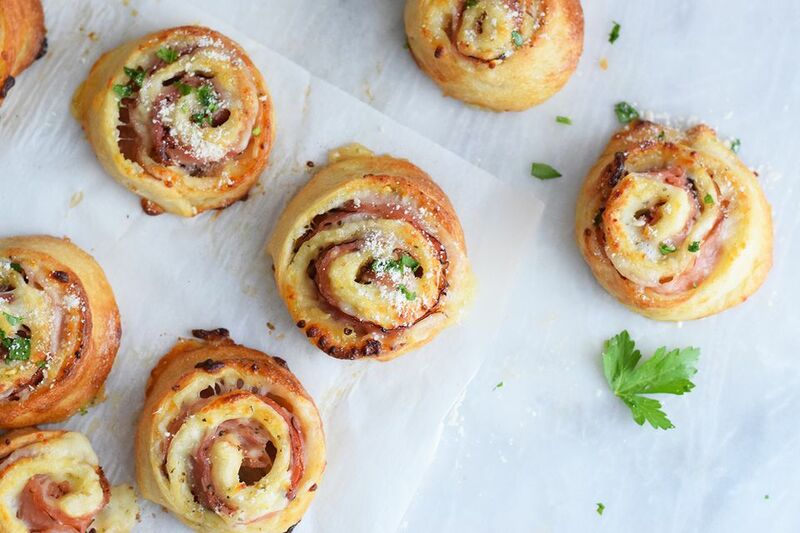 Ham and cheese pinwheels are insanely easy appetizers that only take eight ingredients (one is which is store-bought pizza dough!). It's easy to throw them together in no time, they're a big crowd-pleaser, and you can even make them in advance. The pinwheels can be stored in the refrigerator for a few days and reheated right before your party. Adults and kids will really enjoy these tasty morsels, which have a touch of garlic and Italian seasoning for flavor. They're cheesy, salty, and crunchy—you probably won't be able to eat just one! Preheat the oven to 375 F. Add the garlic and Italian Seasoning to the olive oil. Roll out the refrigerated pizza dough into a large rectangle and cut off any uneven edges if you wish. Even spread the olive oil mixture over the dough. Sprinkle the Parmesan cheese and half of the mozzarella cheese over the entire surface of the dough. Cover the surface of the cheese with the deli ham. Sprinkle the surface of the ham with the rest of the shredded cheese and start to roll up the dough starting with the end facing you. Roll the dough as tightly as you can. Seal the edges of the dough together by pinching the dough together. Slice the dough into 9 rounds. Place them on a parchment lined baking sheet. Whisk together the egg with a teaspoon of lukewarm water until it is completely blended. Brush the egg wash over the top and sides of the pinwheels. This will help to brown them while they are cooking and it helps hold the pinwheel together as it bakes so that less cheese oozes out of the sides. Bake for 15 to 20 minutes or until they are puffed and golden brown. Top the pinwheels with a little chopped parsley and serve immediately with marinara sauce on the side, if desired., They are also delicious at room temperature. Make sure to line your baking sheet with parchment paper, not aluminum foil. This will prevent the pinwheels from sticking and protects your baking sheet from burnt cheese stains. Use freshly chopped garlic for the best flavor. you can substitute the Italian seasoning for freshly chopped herbs if you wish. Throw them in the fridge if you aren't serving them until later. Reheat in a 325 F oven for five minutes. Try adding different meats, like pepperoni, salami, or capicola. You can also include different cheeses like shredded cheddar or Monterey Jack. Try adding bacon, chopped jalapeno, scallions, and a smear of raspberry or fig jam to the filling along with the cheese of your choice. This creates a sophisticated pinwheel that's salty, spicy, and sweet all at once. You can also make your own pizza dough instead of using the pre-made variety.